One of my favourite ways to help children review and understand stories is my retelling them in their own words, through play or with activities. 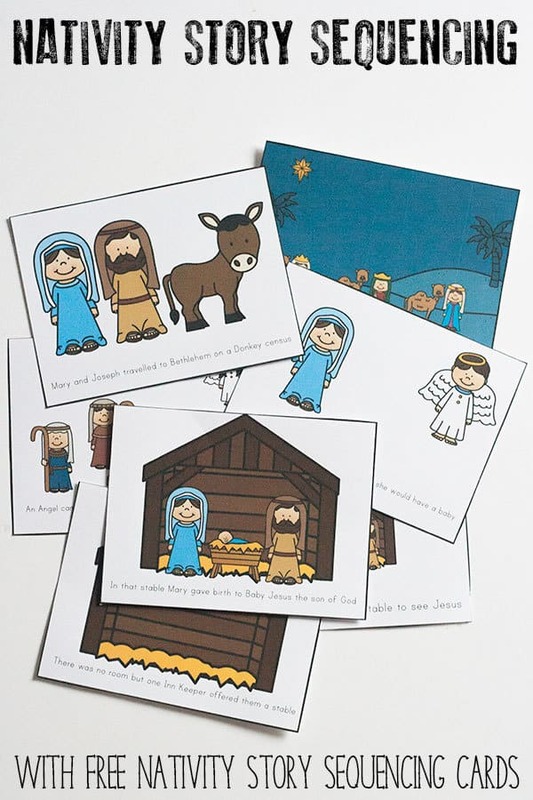 In this simple activity, we use a set of story sequencing cards based on The Nativity Story to order, retell and understand the reason that we celebrate Christmas. 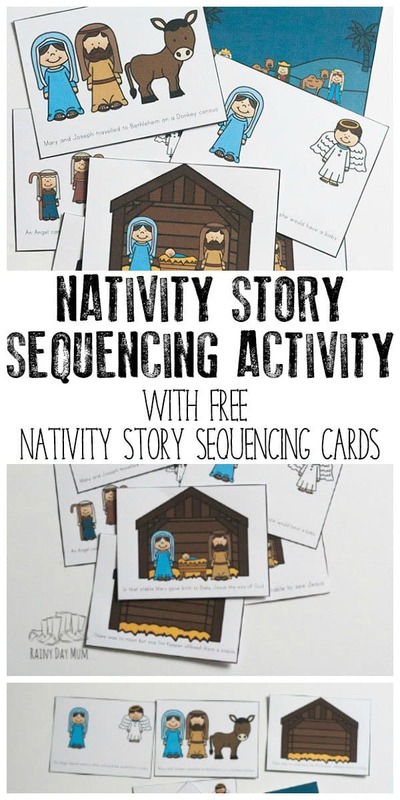 Please check through to the end as I have a suggestion for you to create a set of Sequencing Cards with your own child too. 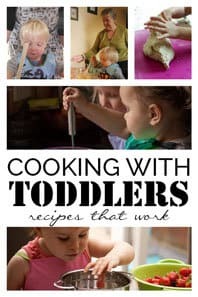 We have included links to products and resources we recommend. 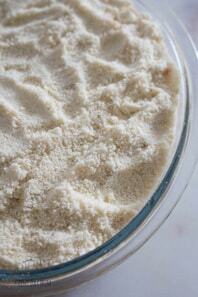 If you make a purchase through these links we may earn a small commission. 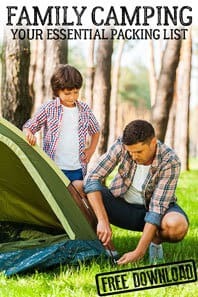 Many children love Christmas, but as we celebrate it’s important that they also have some understanding of why it is celebrated and the story behind how a pagan festival became one of the most important events in the Christian Calendar. To help them understand a good version of The Nativity story in book form can help – one of our favourites is this Little Golden Book The Christmas Story which retells the events of the Christmas Story in a way that children can understand. 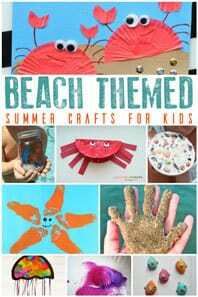 Check to the end of the post about involving your children to create your own set of story sequencing cards if you want your child to produce them as well as use our remade cards which you can download when you sign up for our Book Based Activities News Letter. Or you can purchase the set in our store. 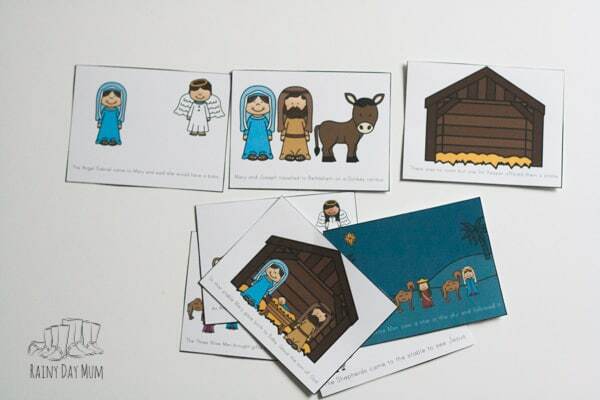 Subscribe and get the Nativity Story Sequencing Cards NOW! 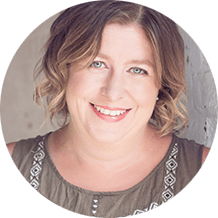 Printer – we have recently switched to an HP Envy with Insta Ink and love how easy it is to use and the quality of the printing. Once you have downloaded your card print onto white cardstock and cut out. 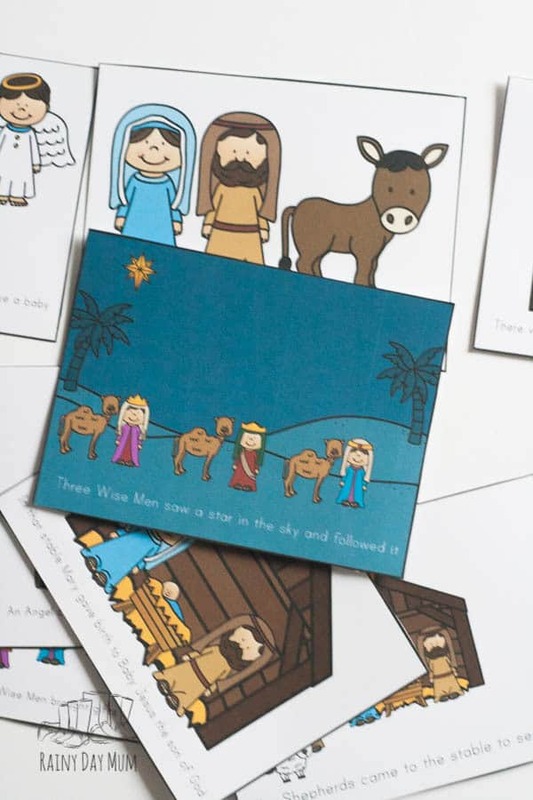 Once made then shuffle and lay out the cards – read out the different simplistic statements and sequence the story to help your children retell the Nativity Story. 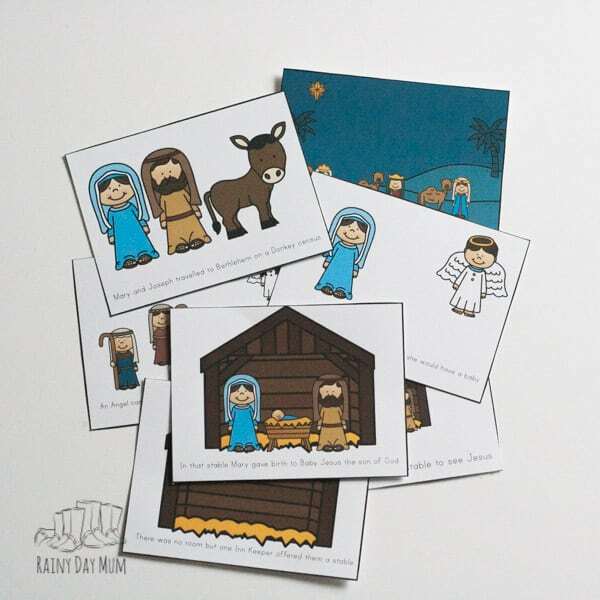 In my crafting supplies I have a set of Christmas Stencils and within that set are some based on the Nativity Story, they are available on Etsy and we used these to create our own Nativity Story Sequencing Cards. 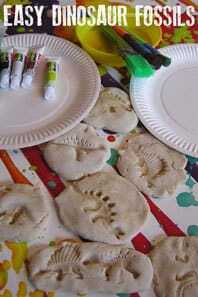 They are washable and easy to use – we attached them to the paper with some masking tape and then drew around the outside and coloured them in with the stencil in place as at the time my youngest was a toddler so it made it easier to produced coloured cards. 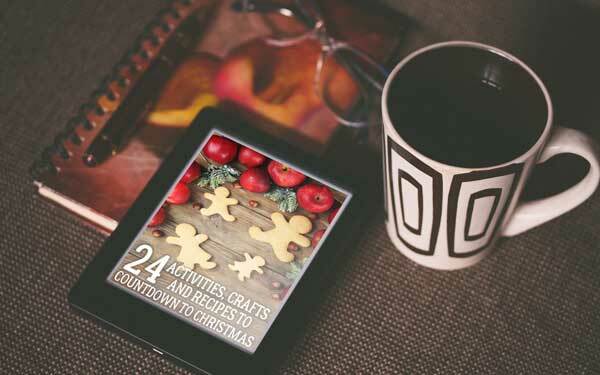 Find all of our Nativity Story Activities and Crafts in one place. This Nativity Set from Fisher-Price was one of the first that we got. 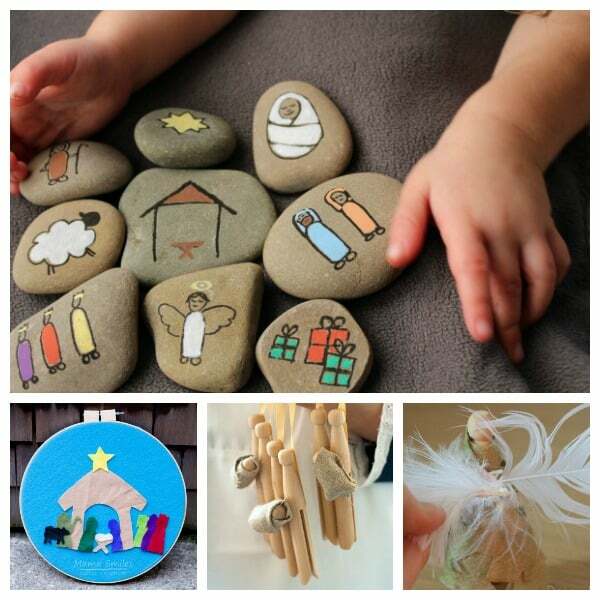 With figures that are easy to hold when combined with the story sequencing cards you can use them to retell the story and play out the Christmas Story. If you prefer something not made of plastic then this Nativity Set from Melissa and Doug is ideal as it’s made of wood and with colourful pictures which is ideal for children to play with and tell the Christmas Story themselves. 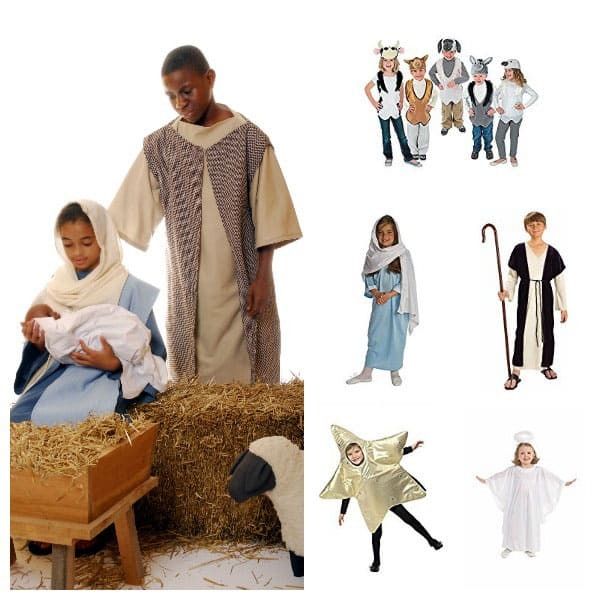 Looking for costumes so that children can act out the Nativity Story themselves – then check out our collection of Best DIY and Store Brought Nativity costumes for kids. 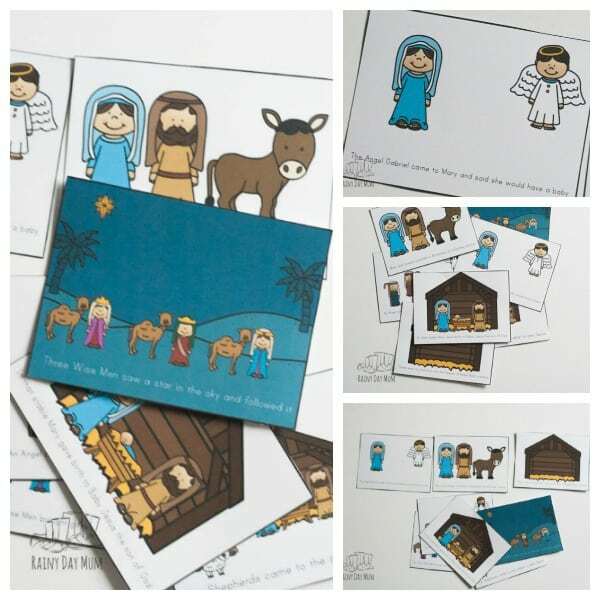 Oh I have an Nativity Pack (#2) coming out that has story sequence cards and scriptures so you can place them down and the kids can look at the cards and I can read the scriptures. I also have set so you can put the story in order! All coming on Friday. I like how you used the stencils to make story cards. 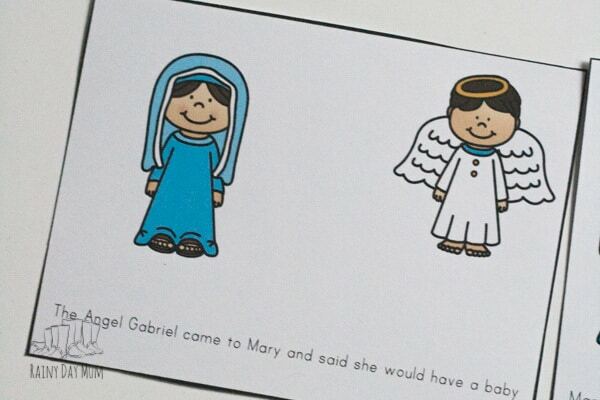 We’ve been reading different books with the nativity story in it. My son connected most with The Birds of Bethlehem, a new book by Tomie dePaola. He tells the whole nativity story from the birds’ viewpoint. We are doing a Jesse tree this year – first time, and I hope the kids like it! 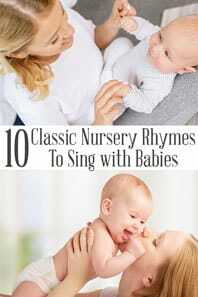 Oh this is great and very different to ours. I think the Nativity is very important. Love this! What a great way to look at the nativity.